A cold winter morning in Stockholm but in the Eriksdalshallen on Thursday 16th November, the heat rose. 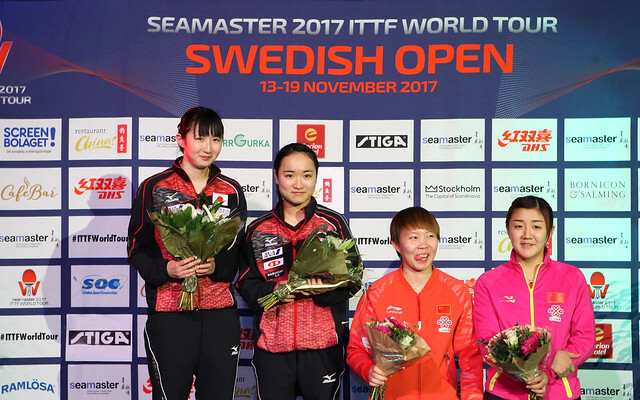 In the opening round of the Women’s Singles event at the Seamaster 2017 ITTF World Tour Swedish Open, China’s Sun Minyang, who had been required to compete in three day preceding qualification tournament, beat Japan’s Mima Ito, the no.6 seed; the 18 year old from Shandong Province emerged successful in six games (11-7, 12-10, 8-11, 11-9, 9-11, 11-4). Memories of the tactics employed time and time again when confronting Ai Fukuhara, a player like Mima Ito who uses short pimpled rubber on the backhand came to mind; absorb the fast attacking strokes, keep the ball on the table and in an attempt to force the pace an errors accrue. The backhand block and the ability of Sun Mingyang was not quite that of compatriot Zhang Yining, the former Olympic and World champion, but there are few players on duty in Stockholm who are better. Equally, when the chance arose, push the ball hard with backspin deep into body, on occasions an error accrued or a comparatively weak return; if the latter the opportunity was grasped with venom. It may all sound so simple; it isn’t; you must have the ability to execute the tactic. Sun Mingyang demonstrated she had that ability. However, one wondered in the fifth game with the winning post in sight, was Sun Mingyang going let the chance of causing a major upset slip from her hands? She led 7-2; then lost nine of the next eleven points. Words from Xiao Zhan, Chinese national coach sitting courtside, set matters straight. Sun Mingyang won the first five points of the sixth game; this time there was no relaxation, the task was completed. Success for Sun Mingyang and as matters commenced in the opening round of the Women’s Singles event; there was more success for China, more success for player from that country who had been required to qualify. Chen Ke beat Korea’s Jeon Jihee, the no.12 seed (8-11, 11-7, 11-9, 11-1, 7-11, 11-6); Zhang Qiang overcame fellow pen-holder Germany’s Shan Xiaona, the no.13 seed (5-11, 11-9, 6-11, 11-7, 11-8, 11-5). Notable wins and there was one more for China but this time as anticipated; a certain Ding Ning, the top seed, beat Austria’s Sofia Polcanova (11-7, 11-5, 11-3, 11-4).